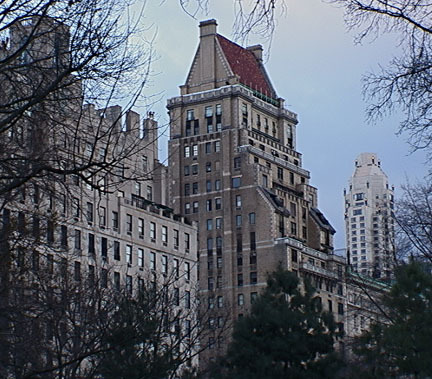 One of the handsomest residential buildings on Fifth Avenue, this 23-story tower was erected in 1927 and its tall, red-tiled, hipped roof has since been a key element on the Central Park skyline. It was developed by Joseph Paterno as an apartment hotel, which permitted a taller building than just an apartment building. It was designed by J. E. R. Carpenter, the foremost apartment building architect of his day whose other buildings on the avenue include numbers 810, 845, 907, 920, 950, 988, 1030, 1060, 1115, 1120, 1143, 1148, 1150, 1165 and 1170. The base of the building is very ornate and handsome and the tall roof is particularly striking because the red tiles are only on the east and west facades and are framed by chimneys. The beige-brick building, which has a four-story limestone base with arched windows on the fourth floor, was erected as a cooperative with 68 two- and three-room apartments. 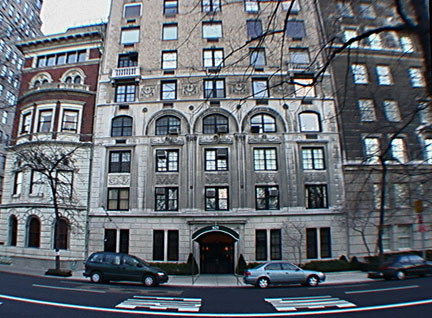 With five apartments per floor, the building has smaller units than many other luxury apartment buildings of its era on the avenue. It has inconsistent fenestration and nice sidewalk landscaping. The building’s location is ideal and very close to midtown. About the only drawback to the building is the number of parades that pass by, but that goes with the Fifth Avenue territory. 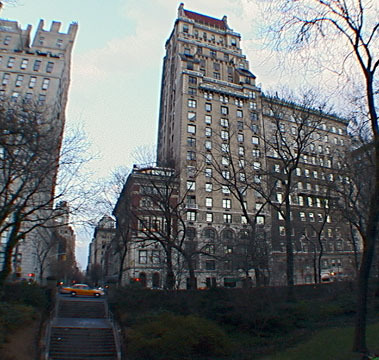 It is also very close to the avenue's entrance to the Central Park Zoo. Needless to say, the building has great views. In his fine book, "The New York Apartment Houses of Rosario Candela and James Carpenter" (Acanthus Press, 2001), Andrew Alpern notes that this building was built as an apartment hotel "with restaurant still operating." His book reproduces an earlier design by Carpenter for the site that called for a medieval castellated form. "In 1947-50," Mr. Alpern wrote, "service pantries legalized as cooking spaces, effectively converting the apartment hotel to an apartment house." "Even for the 1920s, an era of skyscraper distinction, the top of 825 Fifth Avenue is striking - a high-pitched double gable of terra-cotta tile, a blaze of Mediterranean red on a cold city of gray, tan and black." It had a dining room supervised by "the Vienna-born Alfons Baumgarten, who had already established the Crillon and Voisin restaurants," Mr. Gray noted, adding that "the building has windows on all four sides, another unusual feature - Paterno felt secure that neither the 12-story apartment building to the south nor the mansion to the north would soon be replaced by higher structures." "The new 825 Fifth Avenue attracted tenants like the publisher Nelson Doubleday; Samuel L. Parrish, a lawyer, pioneer golfer and art patrons who founded the Parrish Art Museum in Southampton, on Long Island; and Paul Moore, a director of the Bankers Trust Company."